Last week, me and my college friends went to Trinoma Mall to have a sort of mini-reunion and also to celebrate a friend’s birthday. At first, my friends want to go to Gerry’s Grill but settled to Gilligan’s Restaurant because one of my friends heard that their bucket of beer is cheaper than what is offered at Gerry’s Grill. 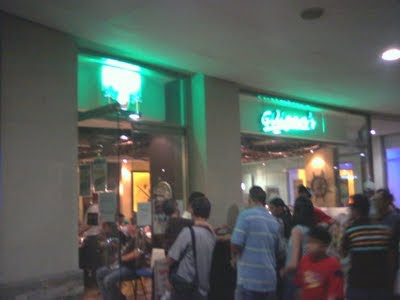 Giligan’s Restaurant is conveniently located at the entrance of Trinoma Mall. Upon entering the mall through its North Avenue entrance and climbing up the stairs to mall proper, you will see Giligan’s to your left. It is purposely placed just outside Trinoma’s premises since this restaurant is open beyond the Trinoma Mall’s closing time. Our group left the mall just half an hour before midnight and I heard that it is still open until three in the morning. Many people dine at Giligan’s and at peak times, people line up and wait for the table to be freed. Waiting for a table to be cleared usually last about 30 to 45 minutes. At peak hours, you need to ask the personnel manning the entrance so as to put you in the waiting list. One thing I like about this restaurant is that they are strict when it comes to students. However, the only way they check if the customer is a minor is if they are wearing their school uniform. 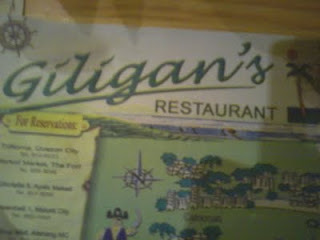 Giligan’s Restaurant is also located at different parts of the Philippines. What I know is that they have branches in Makati and Tagaytay City. Giligan’s Trinoma’s set-up is nice. They have a separate area for smokers and non-smokers. The area for smokers is at the open area. Located in the open area is also the stage where the live band performs. Thus, you will have a better treat if you are a smoker because you are closer to the live band and you could actually watch them perform while you are eating. You will be surrounded by seafarers’ implements when you are inside Giligan’s. The walls are adorned with ancient maps, telescopes, sextants, and compass. 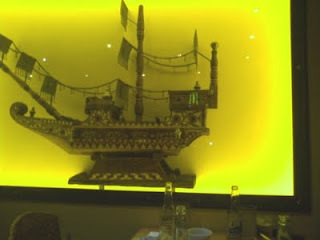 There is even a model of an ancient galleon. Their ceiling is adorned with ropes and is also used to tie the restaurant’s sound system. Giligan’s crew is nice and approachable. The food is good and well presented, though nothing on their menu is notable. 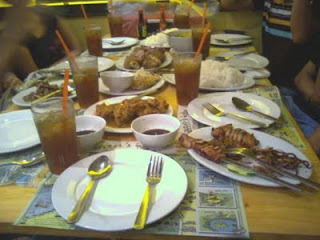 Our group ordered Chicken Lollipops, Grilled Squid, Grilled Bangus, and Kare Kareng Gulay. Our drinks are iced tea, which are not bottomless. What I liked is the Chicken Lollipop since I am more of a chicken/pork meat eater than a seafood eater. The Kare Kareng Gulay is really just Kare Kare with no meat but only have veggies. What I like with their Kare Kare is its partner, the Bagoong (shrimp paste). Their bagoong is good and blends well with their Kare Kare. Be prepared though to pay a fee of one hundred pesos (about two US Dollars) if you will eat a food, like cake, that you bought outside Giligan’s. Giligan’s only offer beer in bucket price (discounted priced) after 10 PM. Before 10 PM, you can only order their alcoholic beverages by the bottle. 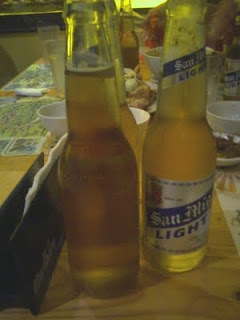 Our group ordered San Mig Light at a price of 40 pesos per bottle. That already includes a bucket of ice and the refill of ice is free. Giligan’s is a nice restaurant to go to. 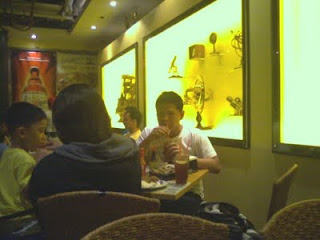 It is a good place to go for the whole barkada. It is a nice place to have nice “kwentuhan” (conversations) with friends that you have not met personally met for a long time. Giligan’s Restaurant is a nice place to take pause and talk your night away. I do think that they are still open. :-) Thank for the visit Ibyang.